Abhijit is Assistant Professor at TERI School of Advanced Studies (TERI SAS), New Delhi, India. He contributes to the Urban Development and Management (UDM) programme of the Department of Energy and Environment. He teaches subjects related to Urban Housing, Real Estate, Finance and Governance. Abhijit is an Architect, Urban Planner with a specialisation in housing and has a PhD in Urban Engineering from University of Tokyo, Japan. 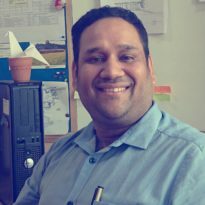 Prior to this, he was Research Associate with Centre for Urban Equity (CUE) at CEPT University, Ahmedabad, India where he was involved in a wide range of research projects not limited to urban housing issues but also sustainable urban transport, informal markets, and urban street vending. He has also engaged in urban sector capacity building programmes for government officials in India. Presently, he co-supervises Capacity Building for Urban Development (CBUD) programme at the University and engages in research pertaining to, inclusive smart cities, urban housing for low income groups and urban reforms.